VRaptorInitialized triggered on application startup, indicating that VRaptor was initialized. RequestStarted triggered the beginning of each request. RequestSucceeded fired at the end of the request only if it has been processed without error. ControllerFound and ControllerNotFound will indicate whether the Controller that answer the url was found or not. 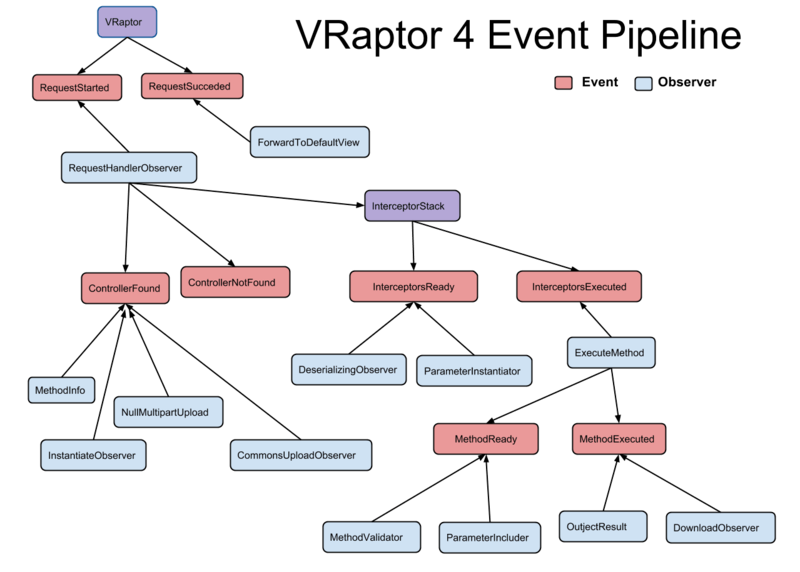 InterceptorsReady and InterceptorsExecuted indicate when the stack will be executed and after its completion. MethodReady and MethodExecuted when the controller method will run and after its completion. It’s important to remember that there is no order in the observers execution, that means, there is no guarantee that a method will be executed before or after any other method that observes this same event. If the order is important, consider using interceptors. This cool feature helps you reduce the coupling of your code in an elegant manner. You can see more information about CDI events in the CDI spec.